We are an artisanal food company focusing on Sephardic and Middle Eastern Jewish cuisines. 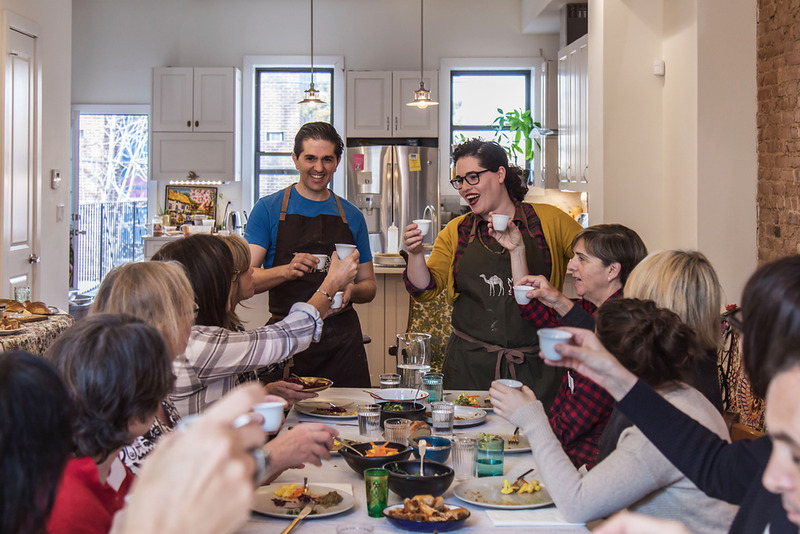 As two Israeli-natives, living and cooking in New York City, our mission is to elevate and share the vibrant traditional foods we grew up eating. Our line of handcrafted pantry staples gives YOU the tools you need to bring true Middle Eastern flavor to your kitchen. The word shuk means "market" in Hebrew, and for us the marketplace represents the center of a community - the meeting point where commerce and culture come together. We try to bring this communal energy, as well as the freshness of a bustling outdoor market to everything we do. In today's modern food culture, so many of our beloved traditional foods and culinary practices are being lost. That is why New York Shuk focuses not only on craftsmanship, but on keeping our edible heritage alive and evolving. In addition to our products, we host various classes, pop up dinners, and events throughout the year that let participants experience authentic Middle Eastern cooking and culture first hand. we invite you to dig in and share in the story. I was introduced to a world of vibrant, flavorful food prepared from scratch, and from the heart. I learned the fundamentals in culinary school, and gained professional experience traveling through France and working in some of Israel and New York City's most established kitchens. But my culinary heritage and the value of tradition remain at the foundation of my work. Through New York Shuk, Leetal and I are grateful to have the opportunity to establish our own version of Mediterranean-Middle Eastern cuisine and, most importantly, to share it with you. As a child, I was influenced by my maternal grandfather, a professional bread baker from Eastern Europe, and my paternal Turkish grandmother, an incredible Middle Eastern home cook. This early introduction to the world of culinary delights inspired me to study pastry and work as a pastry chef. Meanwhile, my passion for food is matched by a passion for the arts. I have a degree in Visual Design and Display from the University of Arts in London, and have worked as a food stylist and photographer. New York Shuk allows me to merge these personal and professional experiences as I develop the creative and visual language behind everything we do. In order to create a meaningful culinary future, we need to understand our past. Remembering and celebrating treasured, edible family memories is a significant part of what we do at New York Shuk. The word authentic gets thrown around a lot in the artisanal food world. But when we say it, we mean it wholeheartedly. Even as we build our own story as food purveyors, we keep our feet solidly planted in the roots of our rich heritage. If you treat simple ingredients with care and creativity, they will repay you with remarkable flavor. Our products start with pure, elemental building blocks - onions, celery, carrots, spices - which we showcase front and center. The notion of not wasting food - of cooking "head to tail" - is not simply a trendy notion for us. It is our life philosophy. It is the way we cook, and always have. Crafting delicious products is only the beginning of the story. We believe in giving our customers the knowledge, skills, and inspiration they need to make this incredible food legacy their own.